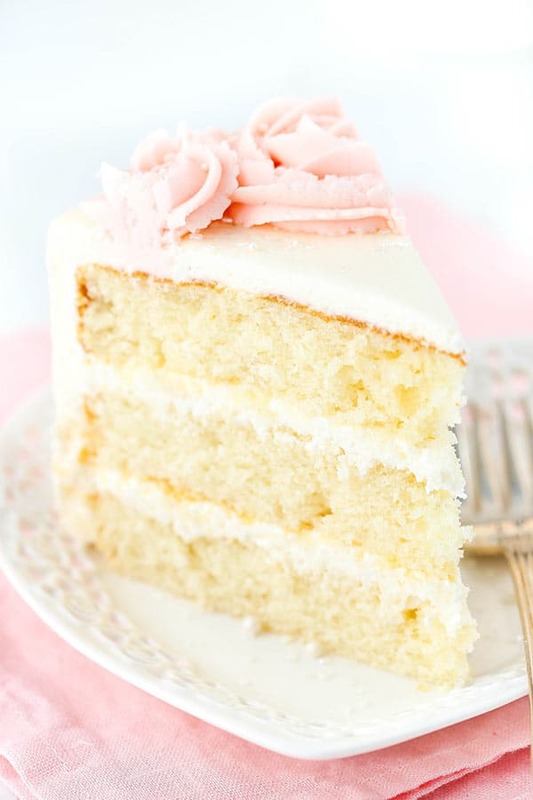 This Rose Water Vanilla Layer Cake is my new favorite! 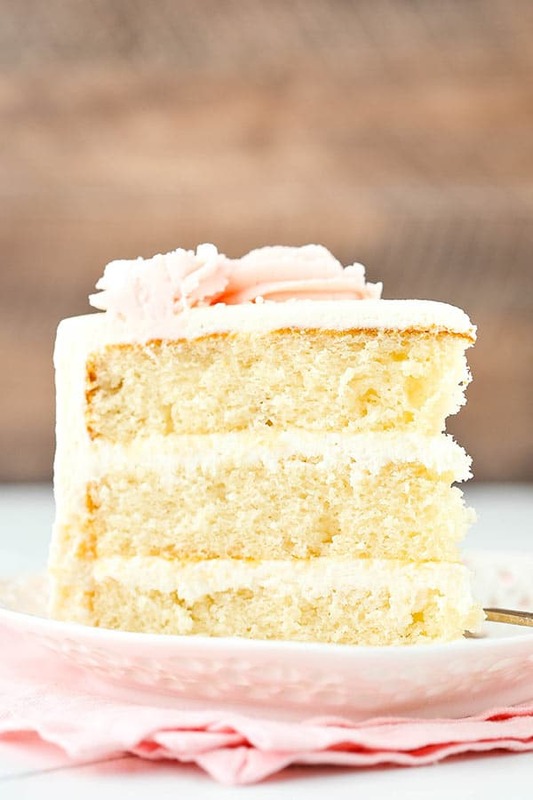 It’s a moist and fluffy vanilla cake with rose water buttercream frosting and it’s SO good! 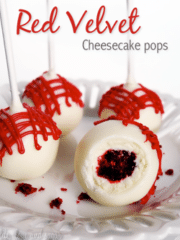 It’s such an unusual and unexpectedly wonderful flavor – I’m dying for you to try it! And since Valentine’s Day is all about the love, I have to tell you a love story. One of my favorite things about relationships (whether it be mine or someone else’s) is the cute little things that couples just do. You know, the things that are unspoken and people just do for each other because they’ve been together and know their routine. Everyone’s got them and some of them are super cute. Well, I went for lunch with my parents over the weekend and my dad ordered a milkshake. When they brought the milkshake over, he was excited but then quickly looked disappointed with himself. He immediately passed it across the table over to my mom, who then asked for a spoon. Looking at me, she noticed my confused look. I mean, it’s his milkshake – why did he pass it to her? “He doesn’t like the whipped cream and always forgets to ask for milkshakes without it, so I eat it off for him,” she said, very matter-of-fact. True love is also this cake. 🙂 At least it is for me. I have seen this rose water (which is meant for baking) many times in the store and have always been curious about what it tastes like. Does it actually taste like a rose? And if it doesn’t, what does it taste like? I couldn’t imagine it, so I had to try it. 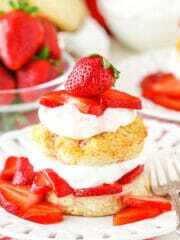 I paired it with a lovely, light and fluffy vanilla cake. Not knowing exactly what to expect, that seemed the best course of action. The cake is relatively straight forward to make, beginning with using the creaming method. The method incorporates air into the batter that gives it lift so it’s light and fluffy. 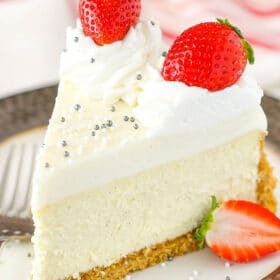 Be sure to fully cream the butter and sugar together for several minutes before moving onto the next step, or you might end up with a denser cake that you’re supposed to. That’d be sad. Next is the really fun part! The frosting! With rose water! It’s my usual decorator-style buttercream. I like to use a combination of butter and shortening because I prefer the taste and texture and then it stays nicer (more firm and less oily) at room temperature. If you prefer all butter, be my guest. The only thing you can’t change is the rose water! It’s SO good! I used about a tablespoon and it’s just enough to give a lovely flavor, without being overpowering. 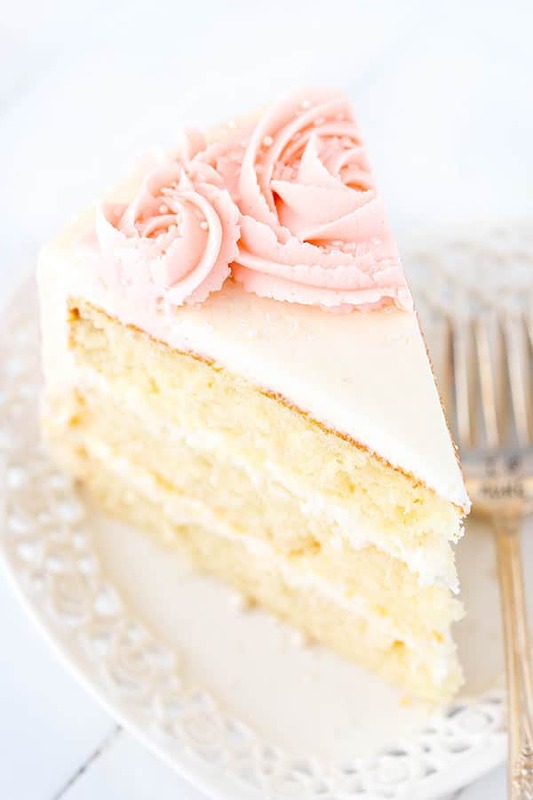 This Rose Water Vanilla Layer Cake is my new favorite! 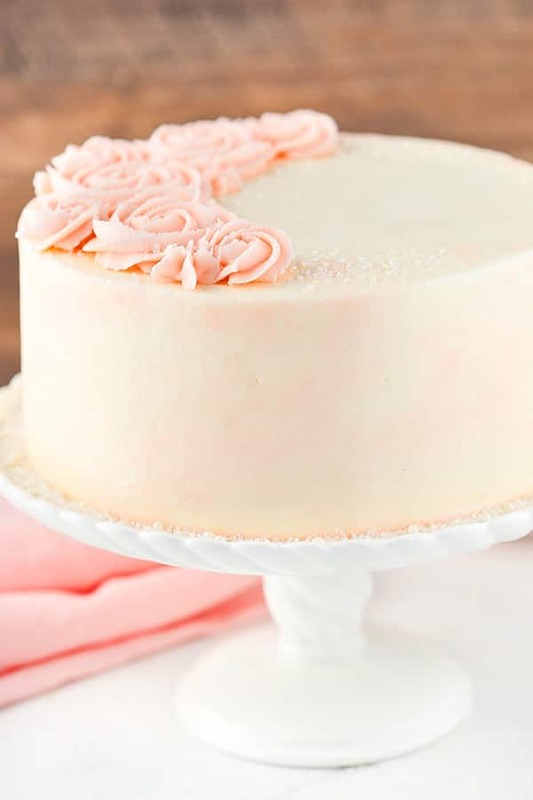 It’s a moist and fluffy vanilla cake with rose water buttercream frosting and it’s SO good! 9. In a large mixer bowl, beat the butter and shortening together until smooth. 11. 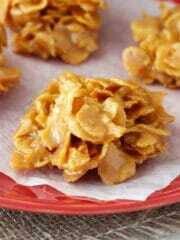 Add the rose water, vanilla extract and 4-5 tablespoons of water or milk and mix until smooth. 13. Color the frosting with the ivory icing color. You will add the pink color later. 15. 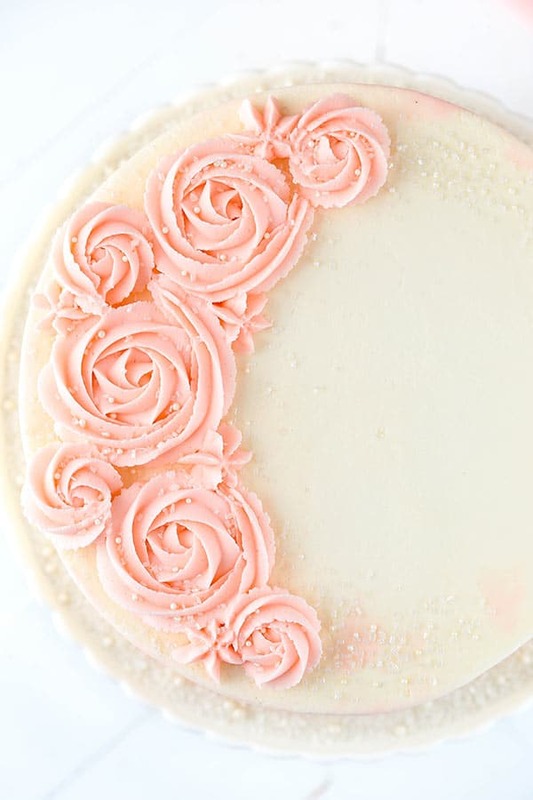 Spread about 1 cup of rose water frosting evenly on top of the cake. 16. Add the second layer of cake and another cup of rose water frosting. 17. Top the cake with the remaining layer and frost the outside of the cake. Refer to my tutorial for frosting a smooth cake, if needed, or watch the video above. 18. Color the remaining frosting with a little bit of pink icing color. 19. 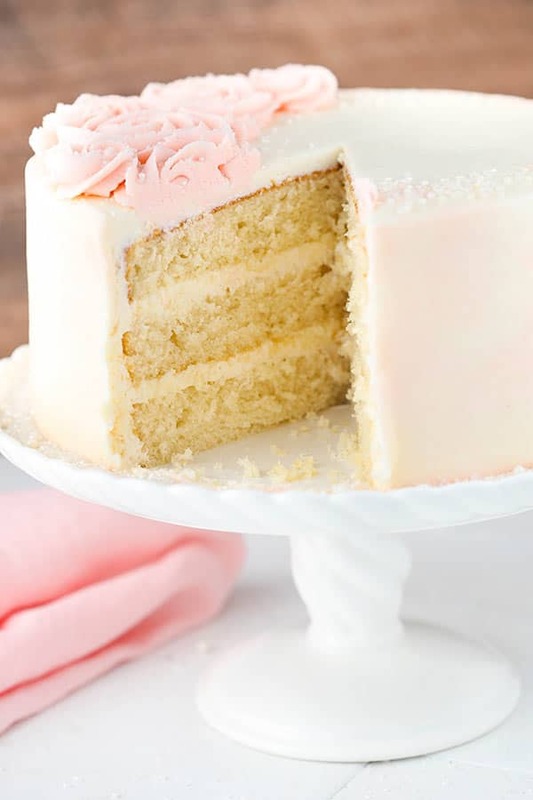 To create the light watercolor effect, use an offset spatula to add a thin layer of pink frosting around the cake. I added a fairly full layer and then removed as much as I wanted. 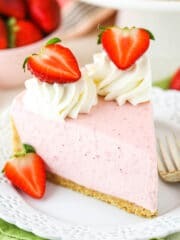 You could also just add the pink frosting in certain spots and smooth it from there. Again, watch the video above for an example. 20. 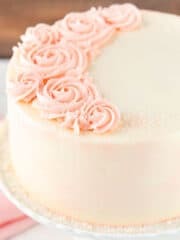 Use the remaining pink frosting to pipe rosettes around the top edge of the cake. I used Ateco tip 844, but Wilton 1M or 2D would work as well. 21. Sprinkle the cake with some sparkling sugar sprinkles, if desired. Yes, it can. Just fill cupcake liners about half way and bake for 15-17 minutes. The full recipe should make about 24 cupcakes. That is such a cute story about your parents! 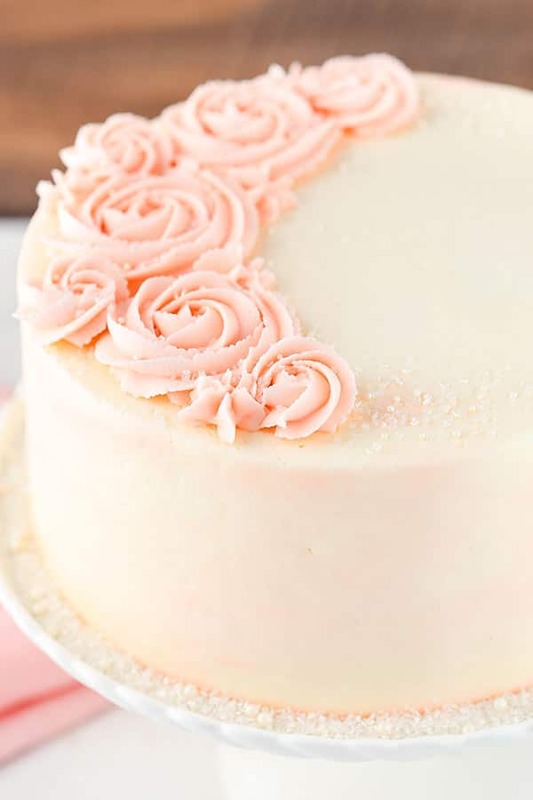 I’ve never tried rosewater in anything but I’ve always imagined that it would have a similar taste to Parma violets (they are a small purple violet flavoured sweet we have in the uk I’m not sure if you have them too) and I love those so I’m sure this buttercream is delicious! This cake is SO pretty! I love the sprinkles of sugar on top. I have never tried rose water before, but it sounds divine! What else is rose water used for? it’s also used in Indian desserts. Rose water originates from Iran and is used in many desserts and even sometimes in savory food and also in our tea. It is quite delicious! It can be used in baklava. Thanks girl! 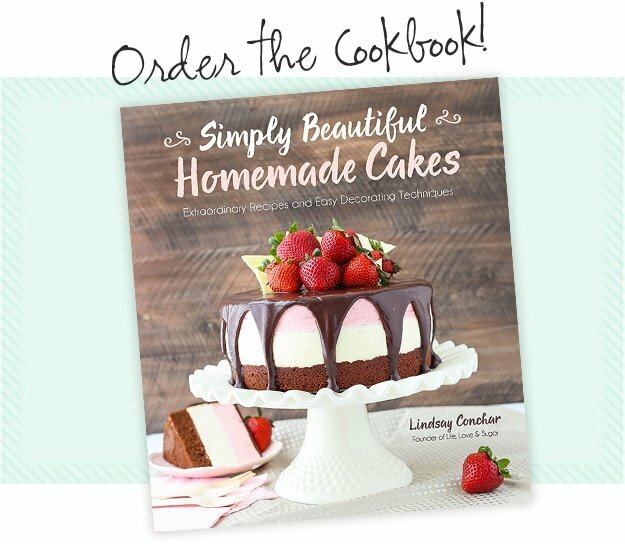 You totally should try it – I know you’d make a beautiful dessert – and it’s really so good. Totally worth trying! such as cookies and cakes. It is also used in drinks. I can’t wait to try this cake. I really don’t use fondant much at all, so I’m not sure. I think it’s pretty sturdy, but it’s also a lovely moist cake. Hi! 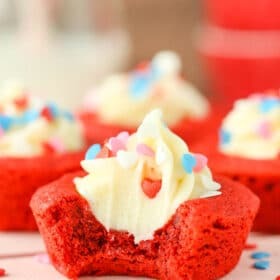 I made this recipe for cupcakes the other day for a fundraiser themed “La Vie en Rose” and they were a hit! I measured everything out the night before, and I only had trouble with the icing. I looked EVERYWHERE for rose water, and I only found out my Persian friend had some after it was too late, but we substituted Numi Organic Tea in the flavor white rose. I accidentally put only part of the butter for the icing (I left a stick out), but it actually turned out really well, and the icing hardened up a bit, so they were easier to transport. Thank you so much for this recipe- I will definitely look for more on this blog! I sub out sour cream with plain greek yogurt a lot – do you think I could do that here? 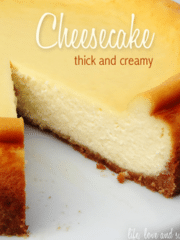 It would probably bake fine, but in my experience the cake isn’t as moist or flavorful. You can bake it in different size pans, you’ll just need to adjust the baking time. It’s a butter replacement. If you aren’t familiar or don’t have access to it, you can just use additional butter in place of it. @Nidhi.. I would substitute Amul or other ghee for shortening. The consistency would be the same but far more flavourful. Can you tell me what the difference would be with this cake and your moist and fluffy vanilla cake? 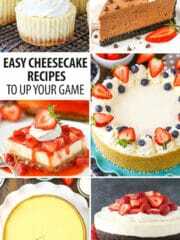 They are just different cake recipes. They are a little different in texture and such. Personally, I’m a fan of this one – it’s a newer recipe. What can I use instead of sour cream, I’m allergic. I know some people like to use yogurt. You could also try using additional milk. I only have two 8 in pans. Can I bake the first 2 layers and then do the 3rd? Will the batter be ok if it sits for a bit? Hmmm, it might be. You could also bake it in two layers – just increase the baking time a bit. What can I substitute sour cream with. It’s difficult to get sour cream here. Some people like to use yogurt. I’d suggest one that is full fat and not too thick. Thank you so much Lindsay. 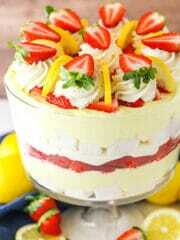 Will use the normal full fat yogurt.. wish me all the best as am taking this recipe for a wedding cake. Hi, is there a reason why you only use the egg whites and not the yolks? Thanks! 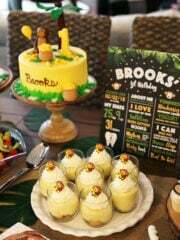 The yolks would color the cake yellow. I think she was going for a white cake for this recipe. I typically will make a cake a day before. If you’d like to freeze it, you can. I suggest wrapping it well and thawing in the fridge before unwrapping it. I hope you enjoy it! Do you know any stores that sell Rose water? You can just replace it with the same amount of butter. Hi, I don’t have any salted butter for the icing. Could I just add some salt? Thank you. Thank you for your wonderful recipe. Do i need to brush syrup on the sponge to keep it moist? You shouldn’t need to. It should stay moist in a well sealed container for 3-4 days. Hi Lindsey! I was wondering if using salted butter in the frosting is better than unsalted. Does unsalted butter make it too sweet? I have both I’m just curious. I personally do think that the salt helps cut down on the sweetness. And yes, you can reduce the amount of powdered sugar – the frosting just won’t be as thick or make as much. Also is there a way to shorten the amount of powdered sugar in the recipe because I’m not sure I have 10 1/2 cups. 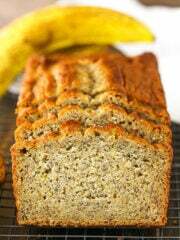 I made this and it’s so yummy and moist! The only problem is it seemed too moist and some of the layers fell apart when I took them out of the pan. They weren’t stuck to the pan or anything. What could I have done wrong? Thanks! Hmm, I don’t usually fine them to be that fragile. I turn them out onto parchment paper on a cooling rack and then I’m able to move them around on the parchment paper. Maybe that would help? This cake is good, but I wish that the batter was rose flavored too. Do you think I could just add rose water to the batter to make it tast like rose? You could add rose water to the batter, yes. I don’t know of a substitute. I want to use this recipe to make my wedding cake but I’m worried about it not being sturdy enough. I want to make two barrel cakes. I am also a bit confused about whether the egg whites need to be whipped before introducing it to the sour cream, butter and sugar mix. I haven’t really made barrel cakes, but I’d think this would be fine. No, don’t whip the egg whites.